Apple’s newest devices feature the Retina Display, a screen that packs double as many pixels into the same space as older devices. For designers this immediately brings up the question, “What can I do to make my content look outstanding on these new iPads and iPhones?”. First there are a few tough questions to consider, but then this guide will help you get started making your websites and web apps look amazingly sharp with Retina images! The main issue with adding retina images is that the images are double as large and will take up extra bandwidth (this won’t be an issue for actual iOS apps, but this guide is covering web sites & web apps only). If your site is mostly used on-the-go over a 3G network it may not be wise to make all your graphics high-definition, but maybe choose only a select few important images. If you’re creating something that will be used more often on a WI-FI connection or have an application that is deserving of the extra wait for hi-res graphics these steps below will help you target only hi-res capable devices. 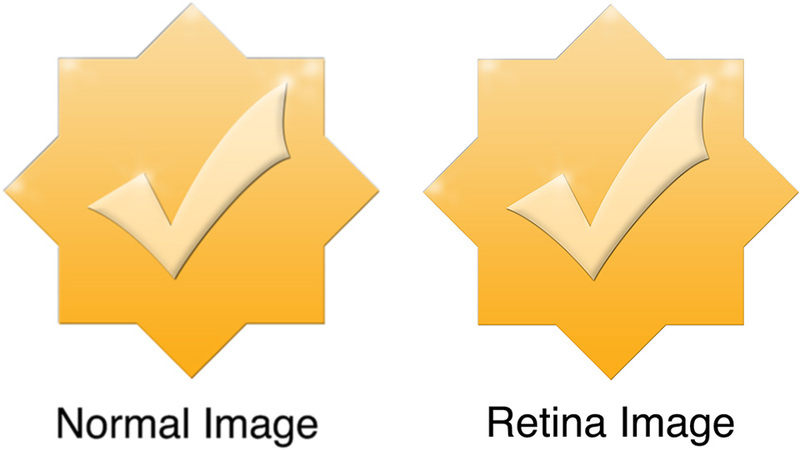 The basic concept of a Retina image is that your taking a larger image, with double the amount of pixels that your image will be displayed at (e.g 200 x 200 pixels), and setting the image to fill half of that space (100 x 100 pixels). This can be done manually by setting the height and width in HTML to half the size of your image file. If you’d like to do something more advanced keep reading below for how you can apply this technique using scripting. If the correct size isn’t specified the device will use the smallest icon that is larger than the recommended size (i.e. if you left out the 114px the iPhone 4 would use the 144px icon). If you’d like to implement a server-side retina image solution, I recommend checking out Jeremy Worboys’ Retina Images (which he also posted in the comments below). His solution uses PHP code to determine which image should be served. The benefit of this solution is that it doesn’t have to replace the small image with the retina one so you’re using less bandwidth, especially if you have lots of images that you’re replacing. If you’re looking for additional information on creating Retina images, I’ve recently had a short book published called Website Optimization for Retina Displays that covers a range of related topics. It contains some of what is above, but also includes samples for many different situations for adding Retina images. It explains the basics of creating Retina images, backgrounds, sprites, and borders. Then it talks about using media queries, creating graphics with CSS, embedding fonts, creating app icons, and more tips for creating Retina websites. I thought that Retina display is equivalent to Samsung’s Super AMOLED, where the level of detail is higher than the eye’s own resolution. Am I wrong? It looks like these are similar in some ways. AMOLED appears to be a screen technology whereas the retina refers to doubling the pixels-per-inch. The phones using Super AMOLED, do have a higher pixel density so you should be able to detect it just like what I’ve described above as long as you have the pixel ratio set correctly. Great article explaining how to implement retina images on websites. You should take a look at http://retina-images.complexcompulsions.com/ (disclaimer, I made it) as it takes care of everything except actually creating the images. Thanks for sharing this Jeremy. That’s a great way to implement on the server without having to download both versions of the file. Added your solution into the article above. Thanks again for sharing it. Thank you very much for this; I’m developing a framework for WordPress and wanted to include Retina support. I was having a few problems getting this to work at first; Firebug was returning ‘$ is not a function’. I found that running the jQuery in no conflict mode made it worked perfectly. I’m glad that this was helpful. Thanks for sharing the solution to the issue you ran into, definitely useful for people running multiple scripts. We just create a containing .div that is half the size of the retina image and make the image 100%. Everything else is done for you. I’m confused… this seems like a really complicated way of making images on a webpage. Let’s say that I have an image whose (original) resolution is 400 pixels wide and 240 pixels high, and I want it to appear crisp on an iPhone. Why can’t I just reference the image in an HTML document with , since that would shrink the image by 2x? Hey Notsimple 🙂 … yes, you could certainly do that. The examples in the article above target only devices that have retina screens so your site still loads quickly for the majority of visitors who don’t have these types of displays. In a site with many images you could be increasing the load time quite a bit by doubling the resolution. If you’re working with a few smaller images this wouldn’t be as much of a concern. Of course, this can be done, however your images would no longer be responsive. How to act with images which don’t have @2x versions yet? Now all images which don’t have a @2x version uploaded are broken. Good solution, thanks for sharing it Sam. Hopefully in the future we’ll have a way to specify multiple images in html so the user/user-agent can determine which is the best to use for it’s display & speed. Cool, good solution as long as js is enabled. Thanks for sharing it. There is now a fall back for if JS is disabled. Hello i have a question about this plugin. all i need to do is just add @2x of my image and that’s it? Thanks! Used this as a reference for adding retina support to my personal website. Hey David. I’m glad it was helpful! Great write up. I started using retina.js (http://retinajs.com/) for my own projects but this is a great reference for doing it all yourself! Thank you. I love the items that make me look better! Thanks for the script it works well. Do you know a way if the large version doesn’t exist it reverts back to the small version? Is this easy to implement? I think you could use that inside the for loop and if the image file exists then change the name, and if not then leave as-is. If I have a large image (like from iStock) and the pixel dimensions are 1900 x 1267 AND I need a final size of 420 x 300 (thus art-directed), do I crop it to 840 x 600 and resize that with css on the web page OR do I crop it at 420 x 300, then scale it up 200%, then again resize it with css on the web page. Also I usually start with a print resolution of 300px. When I run an image through miniJPEG or TinyPNG, I get back a 72px image, so I don’t think I have to change the resolution at all before I compress it. Thanks, Kyle (I came here because the post on PACKT publishing didn’t have a comment section. Hey Greg, I’d crop/resize the image file to 840 x 600 and then resize via css (width: 420px; height: 300px;) or html (). Yes you shouldn’t have to change the resolution DPI if you’re saving as a jpg or png. Everything should end up at 72 DPI for the web. That’s great that you’re using those compression tools too, that helps quite a bit making sure you’re not wasting bandwidth. if an image has double the length and double the height, you get 4 times as much pixels. same goes for the dimensions it’s displayed at: it’s just 25% de size when you use half the physical length and height. simple maths. woow..something unusual..Great article for creating retina images in website.. I need help regarding retina ready website. I am confused is there any difference if can make a png format retina image with @2x expect of SVG format? also want to know how image will set width/height on different screen sizes. Amazing Stuff !! very helpful ! !